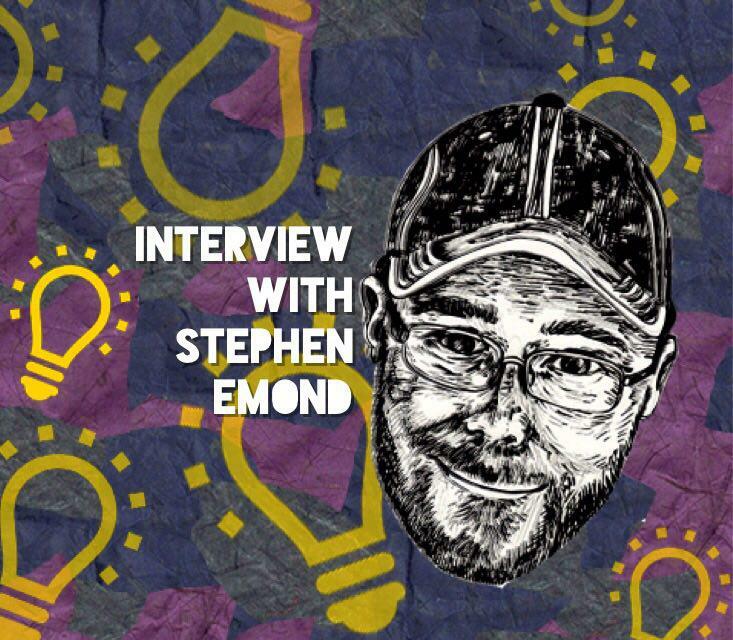 Stephen Emond is an artist and author, who dabbles in both YA literature and comic books. He started off with the comic strip STEVERINO that lasted six years that helped him develop as a writer and artist. After this, he published Happyface and Winter Town, two books that relied heavily on the art. His most recent release is the book Bright Lights, Dark Nights that deals with issues such as police brutality, racism, and the complexity of these issues. I stumbled upon Bright Lights, Dark Nights late last year, as I was in my hometown’s public library, not looking for anything in particular. I read his books Happyface and Winter Town a year or two ago, but they never quite touched me as much as his latest one did. It was right after the events that took place at the University of Missouri that I picked it up and was intrigued and excited to learn that it touched upon these issues. Emond did it in a way that wasn’t lighthearted and/or presented as black and white, but also focused on subjects like first love and family. Did social justice topics always interest you? Not especially - most of my books and ideas are more personal in nature, so I couldn't say that I come to writing with a purpose of change or politics. With Bright Lights, Dark Nights, it was more that those topics branched out from the story I was telling about an interracial couple. Some of the comments I've heard since publication deal with how much farther real life has gone from the events of the book, and how I didn't tackle the issues hard enough. The book was started in 2011, so a lot of the most recent events happened as I was pretty far into the book already. At some point, I did realize that there were two books there, one of them a very socio-political look at the racial climate, and one a love story between two teenagers. I guess, in the end, my primary interests were in telling stories about people. All that said, it was a very new experience and has changed the way I look at storytelling. I can see the book changing the way I write and think about projects. At what point did you realize that you wanted Bright Lights, Dark Nights to tell more than a story about love? The book changed very gradually as I worked on it. It was always a story about Walter and Naomi, though the final product and the initial pitch have little in common. I like to use art in my books, but it's always a challenge to find the why’s and how’s for it. At some point, I had the idea of films noir, 40's black and white crime movies, that painted the tone of the book. The cop going crooked to right the perceived wrongs, the tough guy talk, the dark city. It led to a crime story and pairing the concept of police brutality and unwarranted violence to the noir stylings and the racial element of the love story all kinda fit together like a puzzle. It became a bigger part of the story the further I went along, probably a reason why a lot of that element is located in the middle and end of the book while the early portions deal more with character and set up. Was Bright Lights, Dark Nights hard or easy to write? It was both. It was hard because I was figuring it out as I went, and because it's very, very sensitive subject matter that took a lot of rewriting to keep away from stereotypes and ensure every character has a 3-dimensional arc to them. It was also easy to write because I loved the world, and loved the characters and writing about them was always fun and something I looked forward to. I feel as if your art doesn't play as big as a part in Bright Lights, Dark Nights as the art in Happyface and Winter Town did. Is there a reason for it? It's just how I envision the book at the start of the process. I tried various methods for including art, like the things I show in the back, the film strips, the watercolors, the "poster" style chapter openings. But none of them felt quite right and it's hard to force something. As I’m moving forward, I'm trying to use art more creatively. How do you strike a balance between your story and your art? It depends on the project, something like Happyface, my first book, involved a ton of art because technically the main character was writing in his sketchbook. I like to do both, I was always an "artist" growing up and the writing came later. It's something that's fun and unique from other authors and something I think people can relate to me, so I do my best to include it in some form. It does seem I've used it less and less as I work on my actual writing craft but I do want to have the art and writing intertwine more going forward. Why did you include blackface? One of the topics I wanted to cover with Bright Lights was the 'casual racism' that pops up, the things you kind of shake your head at, the things people say or do maybe not intending to ruffle feathers but need to be addressed and pointed out. In the case of the guy in blackface at the Halloween party, that was simply something I saw in real life, and the person did it well enough that people had to point out to each other who it was, and that it was a white person. The theme of the party was "video game characters," and I believe he was CJ from Grand Theft Auto San Andreas. It was one of those "Really...? You couldn't think of any other costume...?" moments that you can see some people defending and others standing against. It sparked conversation in real life so I figured it could be a good moment in the book. A lot of YA novels are whitewashed, as in they focus on white characters with little to no inclusion of people of color. What pushed you to make a story not only involving people of color but of the issues they face day-to-day, as many novels that do include PoCs don’t bother to? This happened very gradually, my initial instinct was to have an interracial couple and not really draw any attention to it. I thought it would just be something a little different from the other books I’d written and was looking forward to exploring it. As I did start exploring it, I thought about how racism is active today in ways it maybe wasn’t 5, 10, 20 years ago, whether internet-related, or what I call “friendly racism,” smaller things that may not be of ill intent, but are racist. I believe the term is ‘microaggressions.’ At some point, my editor noticed I had two books going on at once, one was about this boy and his comic book fantasies, and one was a realistic look at an interracial couple and the racism they face, and she thought that was the much more interesting story being told. So I went back to the drawing board from there with a new focus. You did a great job of showing how racism isn’t always black and white—as in, right or wrong—was that your goal? It definitely became a goal – I worked hard to make every character three-dimensional, I didn’t want anyone to be flat-out WRONG, I didn’t want a hero and a villain, it’s all very gray material. I mentioned in the back of the book that I viewed the story less as a monologue or some kind of lecture on race, something I wouldn’t qualify myself to do, but rather as a discussion. I wanted to look at as many viewpoints as I could and toss them all together and see what drama unfolds from it. Basically, I had a subject matter, and from there I wanted every character to approach the same subject from a different angle. Ideally without anyone being clearly in the wrong or in the right. Most books that talk about racism are written by the oppressed. Why do you think white people don’t write about social injustice topics such as racism? I would guess we see a lot more of it with how topical it’s become in the past few years especially, it’s right at the forefront of the news cycle so it’s on everyone’s minds. I wouldn’t be surprised if we see a lot more discussion in the near future. I started this book in 2011 and my editor and I would have conversations about excessive police force issues going on in New York, I never imagined the things that were right around the corner, the killings and horrible injustices we’d end up seeing so regularly. In that respect what I was working on just fell into a mainstream conversation, and in fact, my book is pretty tame compared to events that actually transpired. Of course, it could also just be that people are afraid to step into territory they don’t feel they have a place in, or to talk about issues that aren’t theirs to talk about. I admittedly had a crutch in that I was writing from the perspective of a white male, and his views and growth stemming from a race conversation. That said, I think it’s a talk for everyone to have and hope it is advanced in a constructive and respectful manner. I’m “between projects” right now but hope to continue to write more diversely and to revisit these ideas myself in the future. A pitch I’m working on now could definitely be seen as a spiritual successor to Bright Lights, Dark Nights, but we’ll see if it gets into production or not. What advice do you have for authors, journalists, etc who want to tackle big and complex social issues in their work? I’m generally not one for giving advice, and tackling complex issues is a difficult thing to do. I guess my advice would be to be very, very careful. I think it’s important to do and a good thing to do, but do it carefully and respectfully. Read it over, read it from every angle, and try to think of how your audience will read it. I know there were many drafts of Bright Lights, Dark Nights, and the subject matter was so sensitive that I was constantly adjusting and deleting and adding to make sure I wasn’t doing harm with my words. Have good intentions, do your research, reach out to others, listen, and be respectful. And if someone tells you that you got it wrong, you got it wrong. Is there anything I didn’t ask that you’d like young readers, journalists, etc to know? I don’t have much on the immediate horizon, but readers can find me on twitter at @SteveEmond, on Instagram at @SteveEmond, or on Tumblr at @stephenemond for the latest, or at least for some random musings, or song lyrics, or nonsense.